There's something about beauty products that provide instant gratification. They're pretty to look at, and they make us extra gorg, too! And while we know our obsession with them causes budget issues and space problems, we still proceed with our purchase, anyway. If you're guilty of a buying MORE despite your ever-growing beauty stash, scroll down to see if you've used the following excuses to justify your makeup, skincare, or hair product spree. "I won't buy another lip gloss until this product expires." "It says free shipping on orders over P1,500." I'll save more money, right? "I don't have this shade." "I won't buy clothes first." Well, this sounds like a very good compromise. 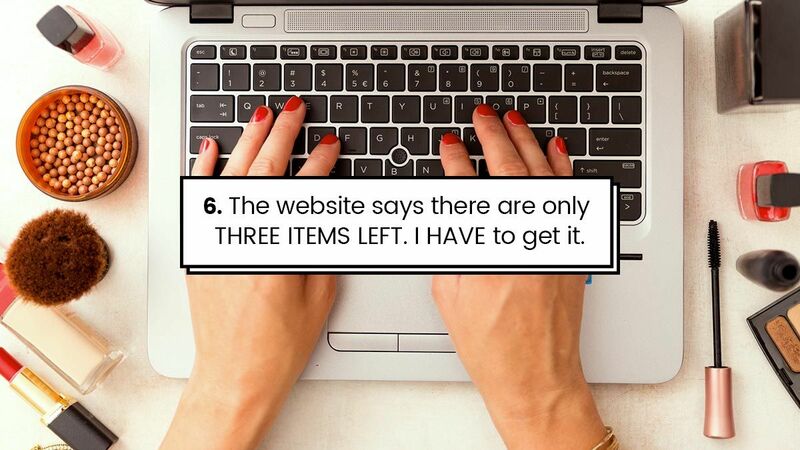 "The website says there are only THREE ITEMS LEFT. I HAVE to get it." "It will last me for two years." Whether via highlighters or Korean skincare—gimme! "I need this as a backup." Like, what if they discontinue this shade? It pays to have one in stock! "It's important to invest in foundation because it covers your whole face." "Oh, I get a freebie with this X amount purchase." "I just threw away all my expired makeup and I need to replenish my supply." Sounds like a valid reason. "The skin is the biggest organ." "I deserve the best; I really do."